WASHINGTON (CNS) — Pope Francis is clearly “a pope of surprises,” German Cardinal Walter Kasper said in an address in Washington Nov. 6, and those who would try to understand the pontiff, he added, should remember his Argentine roots and how they influence his theology and his world view. 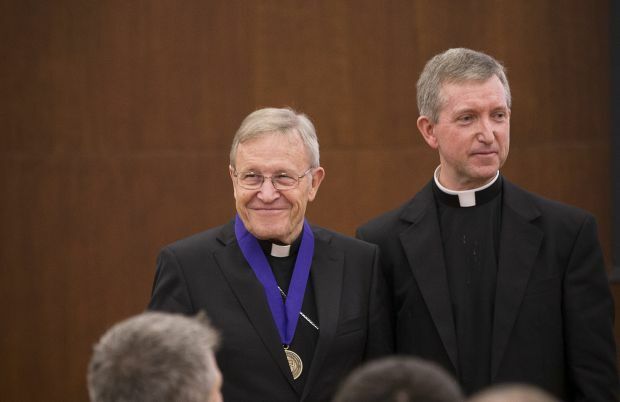 The president emeritus of the Pontifical Council for the Promotion of Christian Unity, Cardinal Kasper was at The Catholic University of America to accept the Johannes Quasten Medal for Excellence in Scholarship and Leadership in Religious Studies. “What for some is the beginning of a new spring, is for others a temporary cold spell,” he said. Cardinal Kasper said Pope Francis “is the first pope to have grown up in a multicultural megalopolis in the southern hemisphere.” That shaped him with some European influences, but he also was strongly affected by Argentine culture, including its films and music. The cardinal compared the theological influences on Pope Francis with those of his predecessor Pope Benedict XVI. Pope Benedict comes from the best European theological traditions, seeking to put the doctrine of the faith into practice. “Pope Francis works differently,” Cardinal Kasper said, and not necessarily in the way in which he is sometimes portrayed. “He’s not a Franciscan in disguise, he’s a Jesuit, through and through.” That means, according to the cardinal, that he begins with a concrete situation and seeks to assess it according to the rules for discernment drawn from the Ignatian spiritual exercises, before arriving at a concrete action or position. Understanding Argentina’s variant of liberation theology also is instructive for those who wish to understand Pope Francis, he said. The same “see, judge, act” approach of the Jesuits describes Argentine liberation theology, Cardinal Kasper said. Cardinal Kasper said the pope is a deeply spiritual man who is convinced that the light of the Gospel is the only thing that can help people fully understand and interpret reality. That insight helps to understand how Pope Francis operates, from a basis of the Gospel as an instrument of joy and of reform. “Pope Francis stands in a great tradition,” Cardinal Kasper said. “He does not represent a liberal tradition, but a traditional position,” as in going back to the Gospels as the source and strength of renewal for the church. Pope Francis doesn’t intend to revolutionize faith and morality, as “he wants to lead faith and morality back to their original center,” to the heart of the Gospels, the cardinal said. Cardinal Kasper said another message of Pope Francis is that it is important that the church not be so self-centered. “A self-centered person is sick,” Cardinal Kasper said. “A self-centered church is a sick church.” Pope Francis wants to leave behind the self-centered, self-pitying church immersed in its own suffering, he added. PREVIOUS: Many factors seen affecting increasingly lower voter turnout in U.S.